China is celebrating the 70th anniversary of the end of World War II. On Friday, a military parade in Beijing grabbed the whole world’s attention. 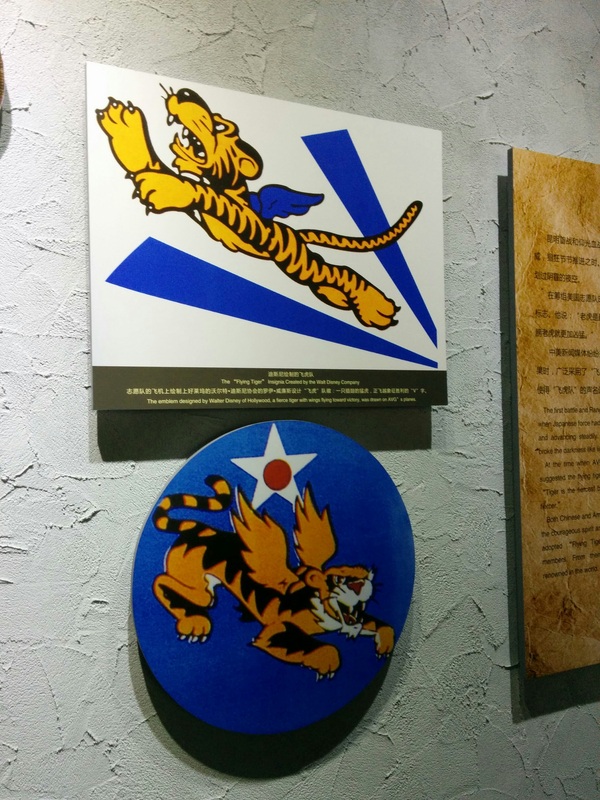 Yesterday morning, on the opposite side of the country, my family and I went to the Flying Tigers Museum in Kunming for a very different way to commemorate the war’s end. 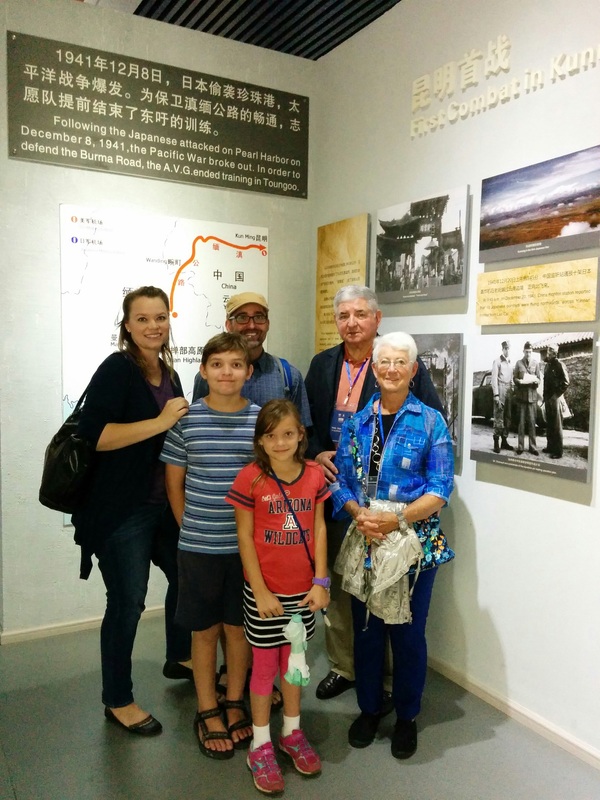 We figured this was a meaningful weekend to take our kids to see the exhibit, which showcases the role of the American Volunteer Group of pilots who were based in Kunming during the war. Little did we know we were in for a very special surprise. 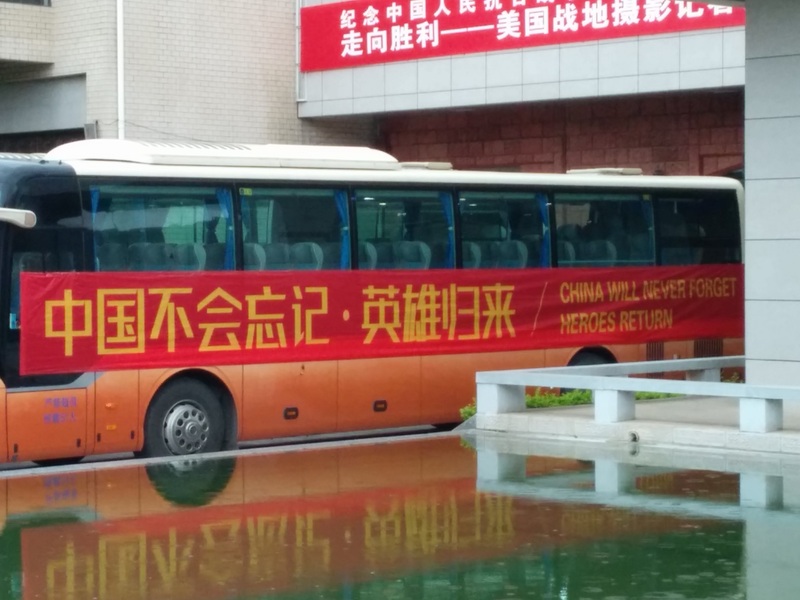 As we walked up to the museum, we saw a few banners like this: “China Will Not Forget – Heroes Return.” I didn’t pay too much attention to them. I figured they were left over from a special event earlier in the weekend, perhaps on Friday or Saturday, the official days off for the entire country. We walked up the stairs to the Flying Tigers exhibit, and saw this sign along with a big group of people, some of whom seemed to be older Americans. Wait, “Welcome, U.S. World War II Veterans”?? 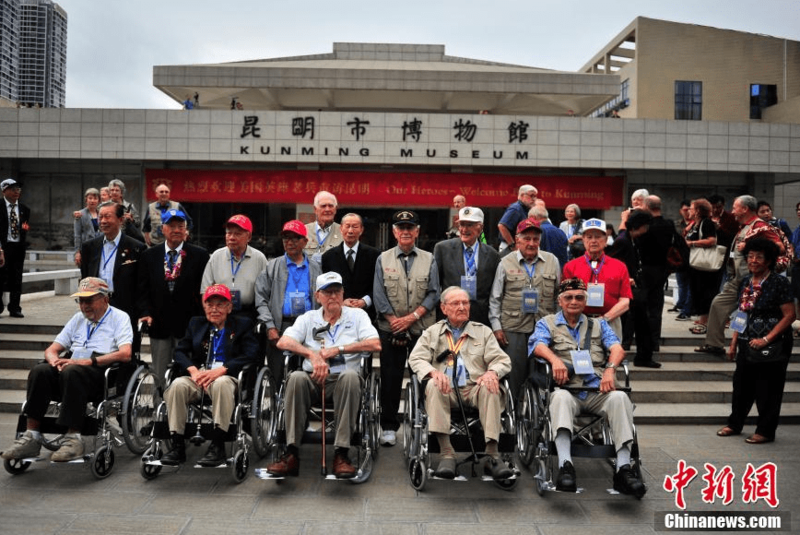 A contingent of American WWII veterans here in Kunming? Here at the museum?!? Yessiree, that’s exactly what was happening. A group of veterans as well as veterans’ children, who are themselves already in their 60s and 70s, had traveled from the States to the museum as part of the anniversary celebration. Nearly everyone had already entered the exhibit by the time we got there, but we got swept up in the tail end of this special group of people as we started into the first room. I think a lot of people just assumed we were there as part of the American contingent, and we were photographed a few times. I won’t be surprised if my kids end up in some news article. However, I searched online and found this news photo that made me smile. These guys deserve to be the focus of the media attention. True heroes! For more photos of the event from this Chinese news site, click here. We didn’t get to meet any of the actual veterans, who I think were way at the front of the group, but we did strike up conversations with some of the visiting Americans at the back of the pack. 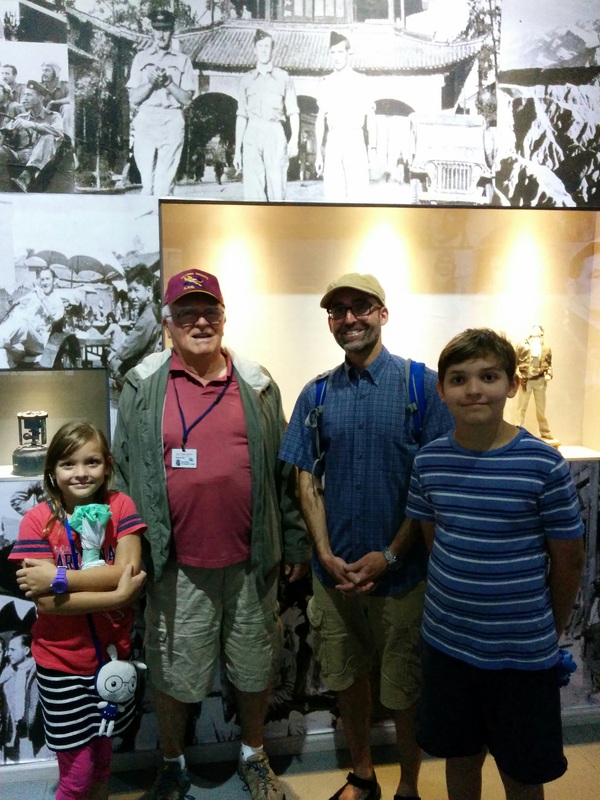 This gentleman’s father-in-law was part of the Flying Tigers. It was his first time to China and he said this was a once-in-a-lifetime trip. This couple was from Colorado, and the husband talked with us for a bit about the history of the squadron (actually three squadrons) and some of the aircraft. It was amazing to be looking around the exhibit with these folks as “tour guides.” The displays at the museum are very nicely done, with handwritten letters and news articles alongside uniforms, pieces of equipment, and other artifacts from the squadron. Here are a few interesting items from the exhibit. 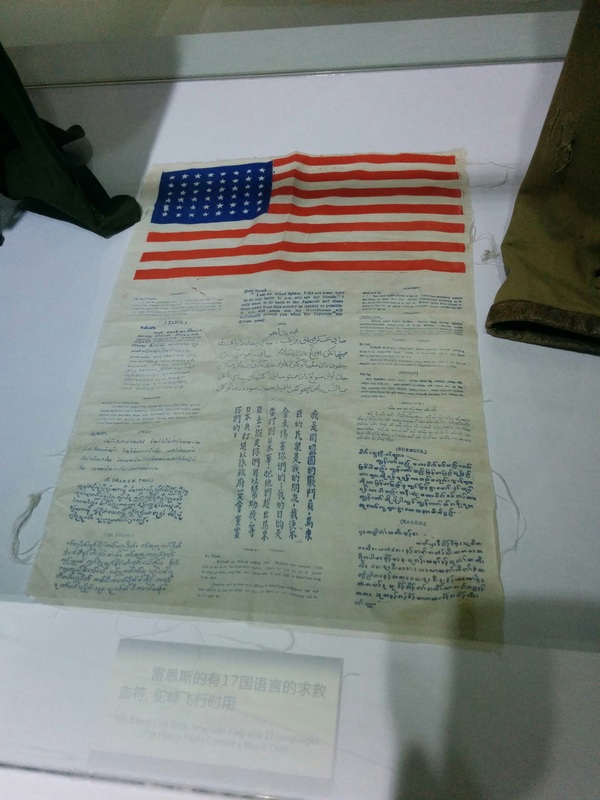 This is a pilot’s “blood chit,” written in about a dozen languages. 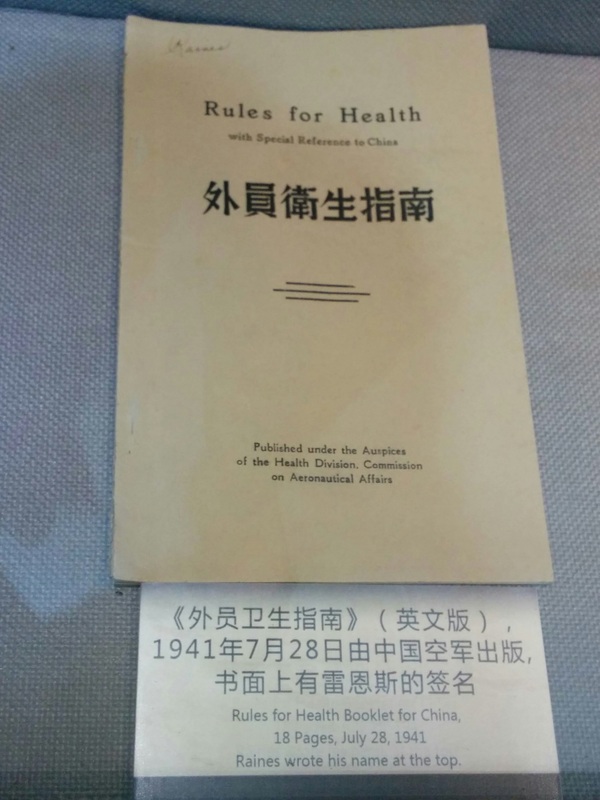 A handbook entitled, “Rules for Health with Special Reference to China.” Raise your hand if you’re as curious as I am to read the inside of this booklet. Flying Tigers logos. The original one is on the bottom. The updated one, designed by Disney, is on the top. 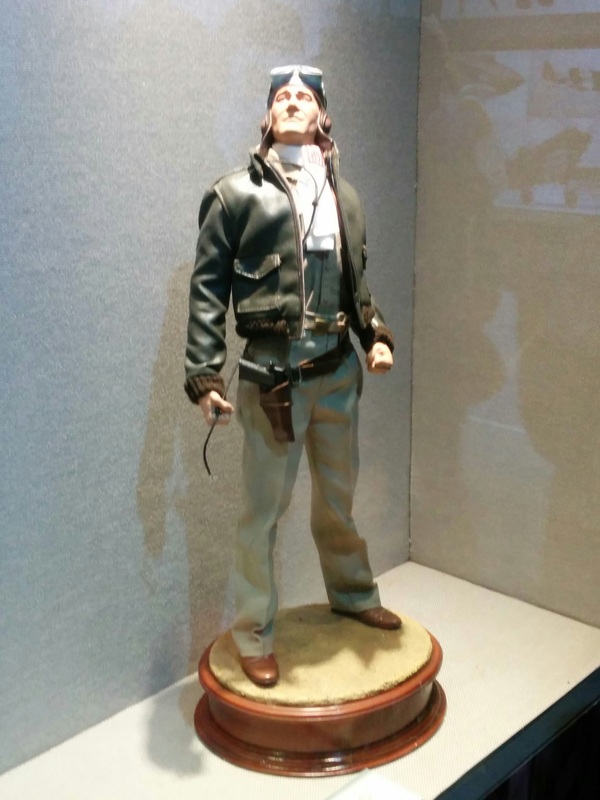 A figurine of John Wayne from the movie Flying Tigers. The famous shark mouth nose art. Not wanting to intrude more than we already had, we didn’t chat for much longer with the visitors. We ducked into a little theater to watch a loop video while the group finished their tour through the exhibit, and by the time we came out, they had moved on to a program in another wing of the museum. We felt lucky to have stumbled upon this gathering, though. 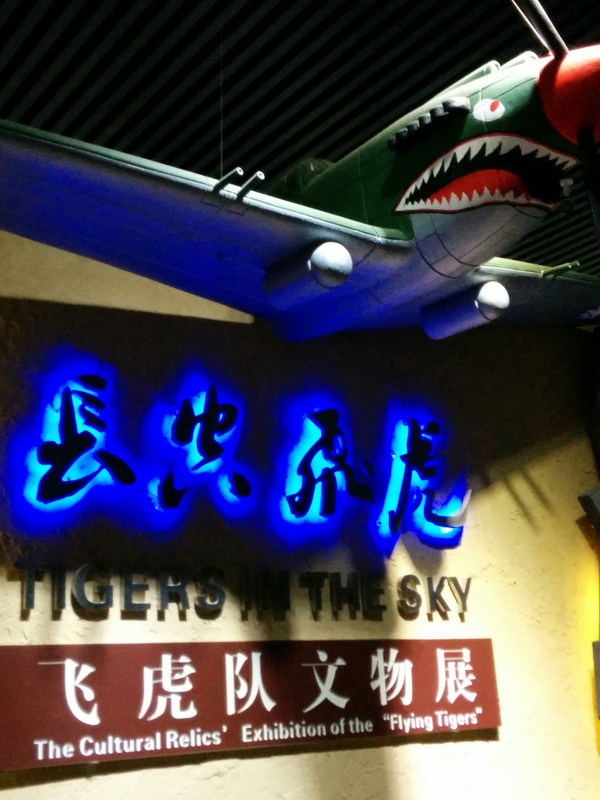 It made our trip to the Flying Tigers Museum much more memorable. 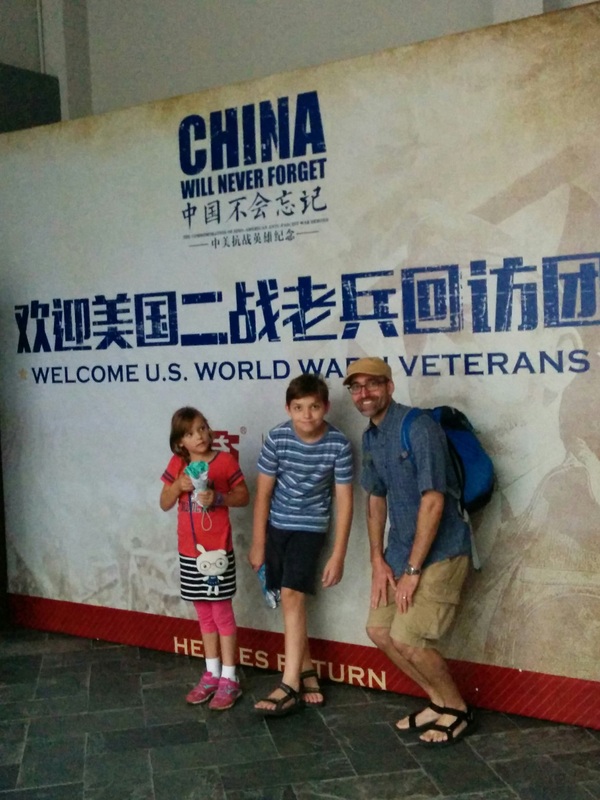 And, for my part, if I was going to get to see a special event in person, I’m glad it was accidentally seeing American servicemen being honored at a museum in Kunming, rather than watching tanks roll down the streets of Beijing. Hats off to all who served in World War II, and may we all mark the 70th anniversary of the war’s end with gratitude. Update September 10, 2015: Here is an article from GoKunming that explains more about the ceremonies that honored the veterans. They met with Xi Jinping in Beijing, and were made honorary citizens of Kunming! That is amazing! I was happy to see the museum when we cam, but WOW, having the veterans there is so neat!!! I know, we feel so fortunate! I think Eric has Grandpa’s blood chit. 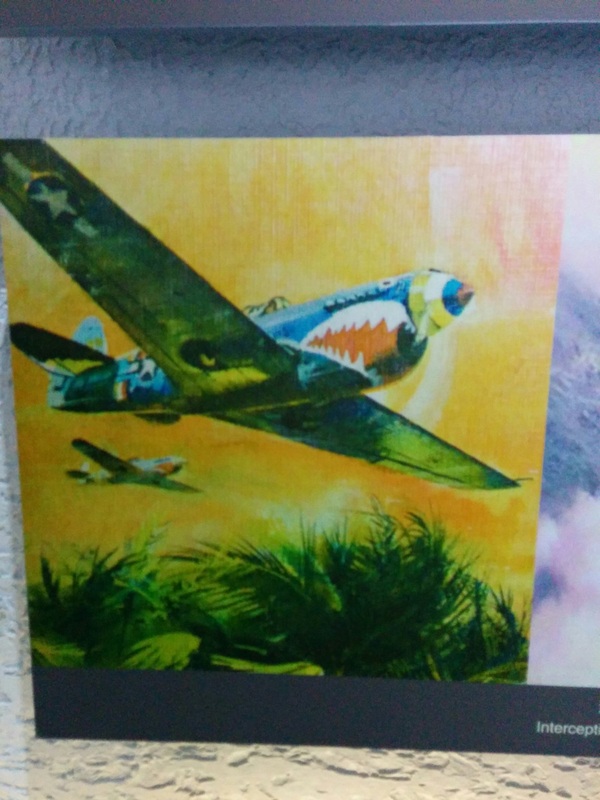 He wasn’t in the Flying Tigers, but he was part of the 8th Air Force and flew in the Pacific.